Once you can scan and locate the inner aura (which was discussed in the last step of this series), the next thing that you will be doing is finding the diseased energy and removing it by scanning, feeling, sweeping, and discarding. We all have diseased energy that needs to be removed. You do this by scanning the aura, chakras and organs of the physical body. In the last post, you felt the aura and you located and felt the chakras of the etheric body. Now, you will need to do a general sweep of the etheric body and chakras and organs. So imagine the person lying down on a healing table that you have. It could be a couch if you do not have a healing table. It would be best if an actual person was there with you lying down. Find their inner aura with your left hand by bringing your fingers together in your left hand. The inner aura is 3-4 inches above the physical body. Trace the inner aura back and forth over the entire body with your hand, following the contours of the inner aura. Just get a good sense of where the inner aura is in relation to the person lying there. It should be 3-4 inches above the physical body. No go to the crown chakra above the head. 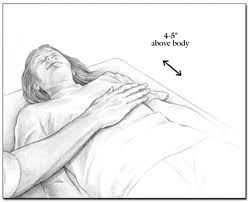 If the person is lying down, it should be 3-4 inches above the top of the head. Remember that the person is lying down, so it will be an extension of their crown. It will not extend up if they are lying down, it will extend outward past their head. Now cup your left hand and bring your fingers together, like you were trying to catch a rain droplet in your hand. As your left hand is cupped, start with the crown chakra and sweep your left hand very slowly down the middle of the body. The cupped portion of the hand should be at a right angle in relation to the lying body. Do this all the way down until you get to the feet. As you are doing this, you should feel sensations in the cupped palm as you are moving the cupped palm down the body. Make sure you have a bucket filled with water. Put some salt in the water. When you finish with the first sweep, then flick the diseased energy into the bucket. This is your bucket that will be filled with diseased energy that you will discard later. Once you do your first sweep in a cupped hand/palm position down the middle of the body, go back up to the crown chakra and do this again, but this time go a few inches above where you swept the first time. Again, sweep the diseased energy into the bucket. Do this again a few more inches above the location of the last sweep. Do this a few more times and then do this going below the original center first sweep. Do this a few times below and below until the entire inner aura has been swept from top to bottom. This should be approximately 13 sweeps. This is the original sweep down the middle and 6 sweeps above and 6 sweeps below the original center sweep. This is just the general sweeping. Once you do this, you will now check the chakras and the organs of the body for any specific diseased energy. Take your left hand and bring your fingers together, and this time you will free scan and sweep. Start with the crown and just move your hand around the head area very slowly about 3-4 inches above the physical body. Feel for anything that gives you any resistance. Feel for anything that feels like little pointers hitting your palm. Feel for anything that does not feel right. Close your eyes and do not look. Ask your team to help you locate the diseased energy. I will show you how to bring in your team in another post. Just move your hand and feel for any sudden pricks on your fingers or palm area. When you find something, move your left hand into a cup position and sweep it away and flick it into the bucket. Keep doing this for 10 minutes or so or as long as you have found all the things that you feel do not belong there. Just scan, feel, sweep and flick. Keep doing this for the entire body. Move from the head, to the heart, to the solar plexus, and the entire body. Move from one chakra to the next, from one organ to the next. Try to visualize the organs and chakras in your head as you are scanning the inner aura. Don’t think or analyze. Just feel. Have the intention of removing the diseased energy into the bucket. You must first remove the diseased energy before you can energize the body. This is what you are doing. You are literally removing diseased and stuck energy. This can be anything that clogs the chakras or organs. This can be negative elemental or negative thoughts that keep you stuck. This can be stuff that causes the physical body to be causing you pain. Again, energy will follow you intention. Plus, in another posting, I will explain and show you how to bring in your healing team. My team is Arch Angel Michael and Raphael, Jesus, Saint Germain, my two main guides who I will call X and W, my Mom, Sananda, Lady Portia and Lady Nada. You will always be guided and supported by your team. Thus, you cannot make any mistakes, as long as your intention is pure and from love to help and heal others. Other posts will show you how to bring down the energies and how to energize the physical, etheric, mental, emotional, and spiritual bodies. You are on your way to becoming a great healer. I am sending all of you lots of love and many blessings. Love. Reblogged this on Violet Flame Records. This entry was posted on June 26, 2013 by Andrew Bojarski in Andrew's Posts and tagged Arch Angels, Ascended Masters, Ascension, Aura, Awakening, Chakras, Channeling, Energy, Energy Healing, Healing, Higher Self, Love, Meditation, Spirituality.